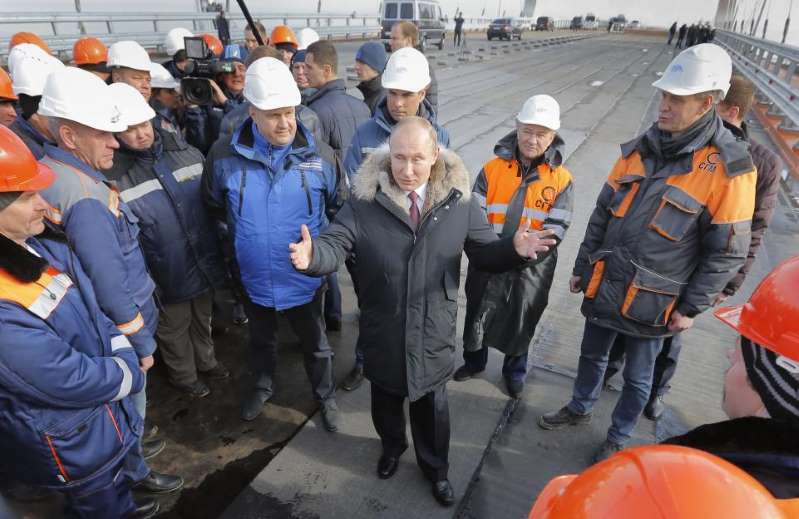 A multibillion-dollar bridge between Russia and Crimea, territory annexed by Russia in 2014, will be opened by Vladimir Putin Tuesday. Putin will lead the ceremonial unveiling of the bridge’s car lanes, alongside industry officials on Tuesday. Public access to the the construction that reportedly cost Russia around $4 billion will be fully open to drivers and pedestrians from the early hours of Wednesday morning. Road authorities have already opened the overpasses leading up to the bridge for drivers and a motorway with a speed limit of around 55 miles per hour will link the Russian and Crimean coastlines. Besides cars and pedestrians, the bridge is designed to also accommodate cargo trucks and run a railway line, though both are expected to open later this year or next year. The bridge’s construction is hugely controversial, not only because most United Nations countries still recognize Crimea as Ukrainian territory—despite it being under Russian control—but also because it obstructs the waterways that link three other Ukrainian regions to the Black Sea. The bridge’s obstruction across the Kerch Strait—the waterway that separates the Black Sea and the Sea of Azov—means that sea traffic from Ukraine’s Donetsk, eastern Kherson or Zaporozhye cannot sail to the Black Sea and beyond, without being granted access by Russia.